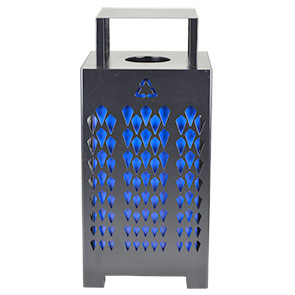 The all-steel Verona Series recycling receptacles combine modern style with efficient functionality. 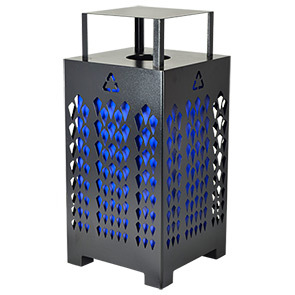 The 32 gallon recycling receptacle bases are designed with laser cut detailing depicting recycling emblems on all four sides and a tapering diamond pattern base which exposes the blue steel liner, creating an eye-catching aesthetic. Verona Series features a unique rain bonnet flat top lid that offers a round trash opening for proper disposal and comes standard with attached security cable connected to the base. A highly-durable, corrosion resistant powder-coated finish is applied to the Verona Series recycler protecting the metal against the elements—ensuring lasting performance in an array of environments.